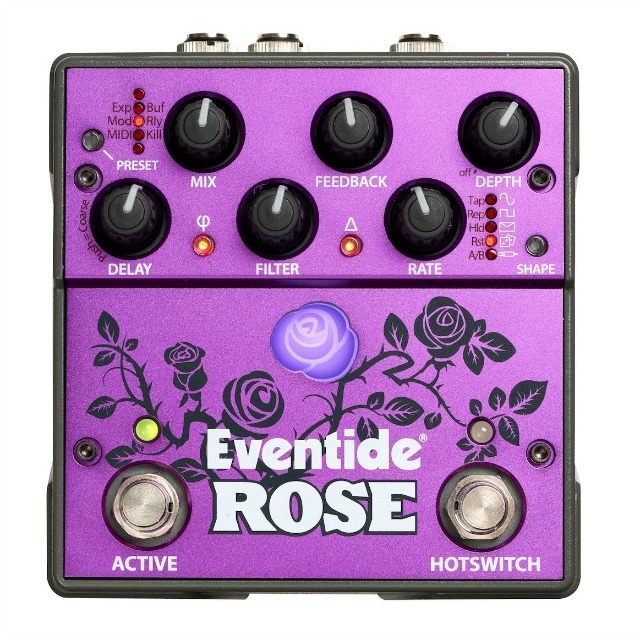 Already previewed at NAMM, Eventide Audio has now officially announced what they describe as a new and unique guitar and bass effects pedal: The Rose. They say that Rose sounds and behaves differently than all other stomp box pedals currently on the market; rather than effects running on a DSP chip, Rose is a simple, pristine, super-modulated, digital delay line (DDL) combined with all-analog circuitry bred for mixing, filtering and feedback. Eventide believes that this novel design allows Rose to deliver sounds that both awe and inspire - Sounds that range from lush to experimental – allowing for the musician to create a wide spectrum of unprecedented tones for the stage and in the studio. The Rose sounds inherently different because of its unusual design. The delay is derived from a variable digital clock that can be swept over a range of ~200kHz for maximum fidelity with up to 10 seconds of delay, down to ~8kHz for 50 seconds of delay. All of Rose’s analog circuitry is employed for mixing, filtering and feedback. Rose is available now for worldwide pre-order with an estimated shipping date of March 15, 2019 for $349.